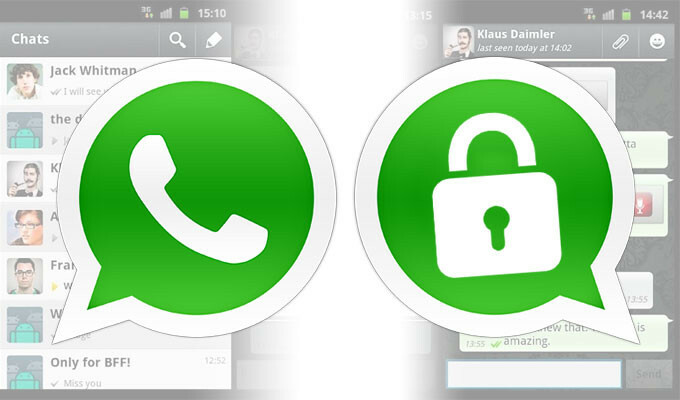 WhatsApp is now end-to-end encrypted at all times. This will ensure that a user's messages, videos, photos sent over WhatsApp, can't be read by anyone else; not WhatsApp, not cyber-criminals, not law-enforcement agencies. Even calls and group chats will be encrypted. Koum wrote, "We've been working for the past two years to give people better security over their conversations on WhatsApp... People deserve security. It makes it possible for us to connect with our loved ones. It gives us the confidence to speak our minds. It allows us to communicate sensitive information with colleagues, friends, and others. We're glad to do our part in keeping people's information out of the hands of hackers and cyber-criminals." In its White Paper, explaining the technical details of the end-to-end encryption, WhatsApp says that "once the session is established, clients do not need to rebuild a new session with each other until the existing session state is lost through an external event such as an app reinstall or device change." The paper explains how messages are encrypted as well. It reads, "clients exchange messages that are protected with a Message Key using AES256 in CBC mode for encryption and HMAC-SHA256 for authentication. The Message Key changes for each message transmitted, and is ephemeral, such that the Message Key used to encrypt a message cannot be reconstructed from the session." It also says that calls, large file attachments are end-to-end encrypted as well. It should be noted that feature is enabled by default in WhatsApp,which means that if you and your friends are on the latest version of the app, all chats will be end-to-end encrypted. Unlike say Telegram where users have to start a secret chat to enable the feature, WhatsApp has the feature on at all times. Users don't have the option of switching offend-to-end encryption. Users need to be on the same versions of WhatsApp to ensure that their chats get end-to-end encrypted. If you've recently updated the app, and you start a chat with someone else (also on the new version) you are likely to see a message saying, "Messages you send to this chat and calls are now secured with end-to-end encryption. Tap for more info." If your friend is nearby, take their phone scan the code from your phone (the option is there at the bottom of the same page) and if the QR code matches, then the chat is encrypted. When the codes match, a green tick appears; when it doesn't there's an exclamation mark in red alerting a user that the chat is not secure. We tried verifying some chats that had the message saying encryption was enabled. In some cases, the verification failed for us. In the first case, we tried to verify a chat between an Android and iPhone 6s device (running iOS 9.3.1), and the QR codes didn't match. We also tried matching QR codes on an two Android phones, and once again we got the red alert indicating no end-to-end encryption. Both Android phones are on the latest version of the app from the Google Play Store. We're not sure why the verification failed, even though the chat says it is end-to-end encrypted. We might have to wait for another app update that could fix this issue. Let us know in the comments if you've managed to get the end-to-end encryption verified on some of your chats.